Whistler Adventure School offers courses to career-driven students across six main disciplines. Whistler Adventure School (WAS) is a career training school offering an Adventure Tourism program, Marketing & Media Manager program, Retail & Manufacturing Manager program and three Guide Training Programs. The Adventure Tourism equips students with the skills and tools across all the guiding disciplines. The Marketing & Media Manager program features courses in photography, photo editing, videography, video editing, internet marketing & social media, marketing strategy and event planning. The Retail and Manufacturing Manager program instructs students in areas such as ski & snowboard manufacturing, ski & snowboard boot fitting, ski & snowboard tuning and bicycle mechanic, granting the skills necessary to build a career in Whistler. The WAS Guide Training Programs are designed to help students specialize in one discipline of ski, rock or alpine guiding as they prepare for professional examinations. Whistler Adventure School is the first school in the Sea-To-Sky corridor to bring Whistler focused professional coursework into the public realm. Our mode of instruction emphasizes real-world training combined with industry knowledge and skills learned through a single course-at-a-time block format. Students will be totally immersed in their chosen subject area until the course is complete. Further, students can feel comfortable that the training they are receiving will prepare them for their career. At Whistler Adventure School, we take education further by instructing at a level of rigor which will prepare you for your entire life. Whistler Adventure School is an officially recognized designated learning Institute of Canada and listed on the government website. In today’s competitive marketplace, it is not enough for students to study basic business principles. Our classes focus on the tools and techniques required by the respective industries to allow students to be competitive. Given our unique block format, our curriculum provides students with diverse opportunities to gain a deep working knowledge of the curriculum. Whistler Adventure School instructors pass on skills, which are highly sought after by employers, giving our students an advantage in their career path. Our students hone their skills to be effective leaders in their career endeavors. Our location gives us a unique advantage, as we are able to utilize the mountains and facilities of the Sea to Sky corridor. Not only are we the only school of its kind in Canada, we also take advantage of the professionals in this region to create a truly one of a kind learning experience. Students entering today’s workplace need specialized skills to be successful. The modern world requires individuals who are knowledgeable, adaptable, and flexible with skill sets that are constantly changing. Our unique curriculum excels in this capacity and allows students to specialize in their education. The WAS instructors are all professionals and highly successful in their respective disciplines. Utilizing their knowledge, we prepare our students for success. Our faculty will inspire students to fulfill their career aspirations and succeed in the workforce. WAS has a brand new Apple sponsored teaching facility located in Function Junction, Whistler. WAS has a brand new production lab, workshop, and classroom within our facility. WAS courses give students real-world skills from experts currently working in their fields. WAS students live, work and play in the mountains, in the Whistler village and experience the best of the West Coast. Whistler Adventure School brings students from around the world to experience living on the beautiful west coast of British Columbia, Canada. WAS is located within minutes from the base of both Whistler and Blackcomb mountains, a world-class ski resort that hosted the 2010 Winter Olympics. WAS is a newly opened facility that offers certification in a diverse range of career building subjects. Our faculty are experts within their fields and have been selected based on their specialized knowledge and ability to teach. Mountain towns such as Whistler and employers in the fast-paced action sports world require employees with specialized skills, WAS is supporting the community and employers by opening up the required training opportunities. 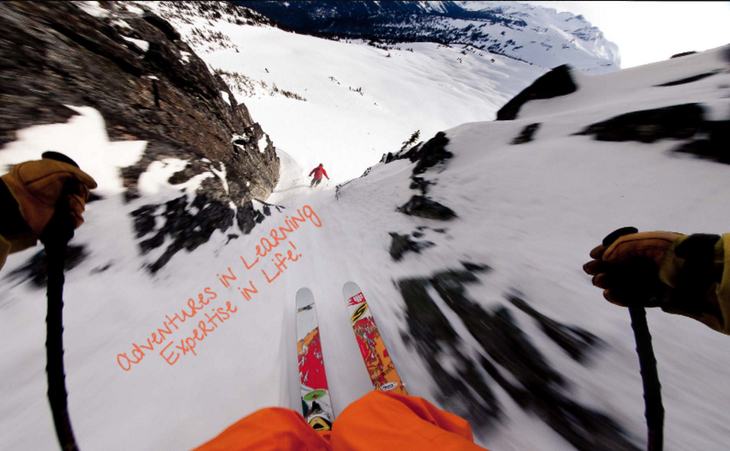 Whistler Adventure School aims to inspire students, encourages students to grow and express their ideas on all courses. WAS offers opportunity beyond the classroom with work co-op opportunities and career building placements. Your educational journey is enjoyed whilst playing in the mountains and living in the award-winning multicultural town of Whistler. Students can complete individual courses or full programs by scheduling their timetable around their Whistler lifestyle.